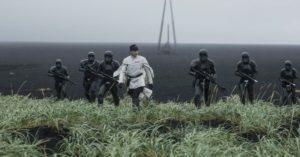 Why Does Lyra Erso Shoot Orson Krennic? I saw Rogue One for the second time a few days ago and one thing that seems somewhat baffling towards the beginning of the movie: why does Lyra Erso shoot Orson Krennic? Surrounded by a half-dozen death troopers, Krennic is not exactly vulnerable, while Lyra clearly stands no chance of surviving the encounter. While it is understandable that she is very upset with Krennic seeking to take her husband away, she cannot expect to survive the experience. So, from the movie, maybe she is willing to die, as long as she also kills Krennic. After all, it is he who personally recruited her husband, Galen Erso, as well as keeping them on Coruscant for a while, and then chasing them down. Clearly, she is very personally upset at Krennic. Perhaps by killing him, maybe Galen could be freed from the work and raise Jyn by himself. Otherwise, she is simply going there to get killed, while Galen gets taken away, leaving Jyn to be effectively orphaned. It does not make sense why she would want her to be raised without parents. However, an answer can be gleaned from the novelization of the movie, written by Alexander Freed. Lyra thinks that she can convince Krennic to leave her husband alone. Thus, she tells Jyn “‘You know where to go, don’t you?’ Lyra asked. ‘Wait for me there. Don’t come out for anyone but me'” (11). * Shortly thereafter, she believes that “Her husband needed her more than her daughter” (12), as she believed she could get Galen out of his predicament. Once she pulls the blaster out, a dialogue breaks out (13), where Lyra tells Krennic, “You’re not taking him”, followed by Krennic’s response, “No, of course I’m not. I’m taking you all. You, your child. You’ll all live in comfort.” In response, Lyra says, “As hostages.” The book describes her reaction: “She’d lived that life before, or close enough. She had no desire to do it again.” Clearly, she is determined not to return to such a lifestyle, but at what cost? She sensed the troopers tensing. She knew, somehow, that Galen was staring at her in horror. And she suddenly realized that she’d misjudged Orson Krennic’s cowardice – that he’d changed in the years since she’d known him, or she’d never understood him even the old days. Here we get to the main piece of her thinking: she thought she could cow Krennic into letting Galen go back to his family, that, perhaps, the blaster would intimidate him. While it is more likely that he had changed in the several years since they had fled from him on Coruscant and had become less of a coward, it is also interesting that she considers that she never understood him in the first place. So, in the book’s telling, she confronts Krennic to cow him into letting Galen go, in somewhat of an underestimated show of force, rather than the movie’s depiction of her, where it seems she is reacting emotionally irrationally at the prospect of Krennic taking away her husband. Furthermore, in the book, she thinks to herself after this that “Jyn would still be safe” (13), so that no matter her actions and death here, Jyn will still live. But, what about Galen? “Maybe she could still save her husband” comes the next line, with a sense of optimism. However, it is clear from the book, as it is in the movie, that she doesn’t stand down and gets killed by the death troopers. Nevertheless, the novelization of the movie does present Lyra Erso less as emotionally distraught at the prospect of her husband being taken away to work and her losing it, willing to sacrifice herself, versus her courageously thinking she can make Krennic stand down and let their family be. It is, I think, a significant difference and adds a great dimension to the story. * Pagination refers to the 2016 Del Rey hardcover edition. Saw Gerrera Becomes a Rebel in Star Wars Catalyst What do we learn about Saw Gerrera from The Clone Wars? Previous What do we learn about Saw Gerrera from The Clone Wars?